Beautiful, peaceful setting with Cynet Lake and Swan River frontage. Picnic table, fire ring, 2 small refrigerators, canoe. Adorable log cabin! Convenants do not allow motorized boats. 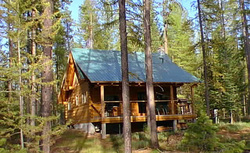 Located 20 minutes north of Seeley Lake. Walk to nearby Lindbergh Lake. Hiking trails and Holland Lake are very near. One bedroom plus loft, sleeps 5; 1 double and 3 twin beds. One bath, tub only. Wood stove and electric heat. Pets allowed for additional $50.